This was a little appetizer board we put together for a dinner we hosted for friends a few weeks ago, but sometimes B and I just like to make a set of snacks like this for our dinner. The star of the show here was really the spicy icebox pickles, which are surprisingly easy to make. We used some pickling spices that we picked up at Seasonal Pantry, but you can make your own using the recipe below. Bring the vinegar, water, and salt to a boil in a large pot. Cut the heat and add all additional ingredients. Let cool and add to sealed container (keeps about 2 weeks in the fridge). 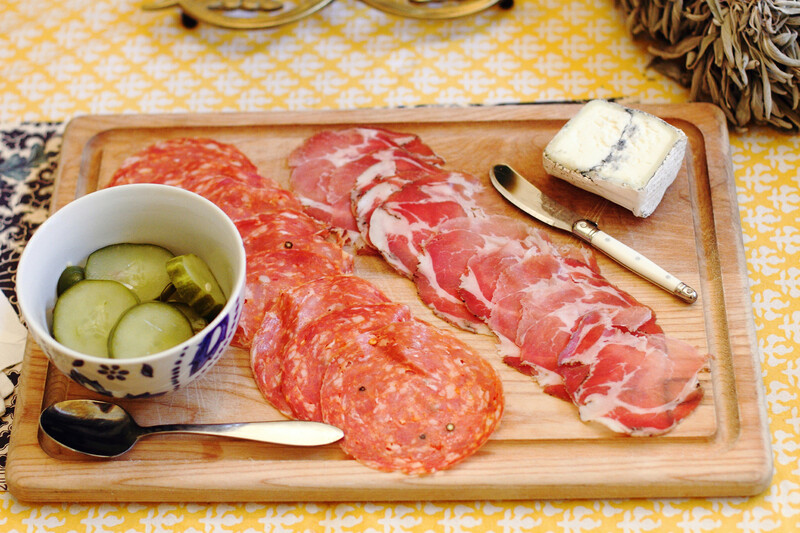 Serve with sweet coppa, soppressata, ash-rolled goat cheese, and warm baguette!